Beginning in 2012, New Jersey mariners may notice a reduction in the number of regulatory buoys on the waters of the State. A boating safety pilot program is being conducted, which will scrutinize the placement of regulatory buoys on the water. The goal of the program is to eliminate many of the unnecessary regulatory buoys that litter waterways such as the Barnegat Bay. Regulatory buoys can be easily identified by their color, which is white with orange bands. A message, such as “slow speed/no wake” is also displayed on the buoy. In 1988 there were about 35 slow speed/no wake buoys placed in waterways throughout the State. During the summer of 2011, there were more than 750 slow speed/no wake buoys in the Barnegat Bay alone. It is possible that up to one third of the regulatory buoys in the bay can be eliminated through this program. The New Jersey State Police, Marine Services Bureau, Point Pleasant Station personnel are evaluating the areas where regulatory buoys have historically been placed, in an effort to determine which regulatory buoys are no longer needed. Once identified, unnecessary buoys will not be placed in the bay for the 2012 boating season. While many factors must be considered when making a determination about a specific buoy, the final determination as to whether a buoy will be eliminated or retained, will be based on public safety and quality-of-life. The buoys that will undergo the closest scrutiny are, for the most part, slow speed/no wake buoys that had been placed in the Bay to warn mariners of a temporary slow speed/no wake area and are no longer required, and buoys that are placed in locations where it is clear, based on the existing laws and regulations that all mariners are expected to know, that vessels are required to slow down to no wake speed. Additionally, alternative means of marking certain areas are being explored. One of the methods being considered is through the use of signs, which would be utilized to warn mariners when they are approaching a slow speed/no wake area, and inform them when they are leaving a slow speed/no wake area. This strategy could be very effective on long narrow channels where a small number of signs could eliminate the need for many buoys. Vessels engaged in activities recognized by the Coast Guard displaying rotating or sequential flashing red and yellow lights. New Jersey regulations define "slow speed/no wake" as the speed at which a vessel moves through the water and is able to maintain minimum headway in relation to the vessel or structure being passed and producing the minimum wake possible. Regulatory buoys (including Slow Speed/No Wake buoys) are placed in the waterways at the beginning of each boating season, and removed at the end of each boating season. While the pilot program is not intended to be a cost saving measure, unnecessary buoys are costly to maintain, detract from the natural beauty of the bay, and pose a hazzard to vessels navigating on the bay. Will the removal of some of the slow speed/no wake buoys allow vessel operators to operate at higher speeds around docks, piers, marinas or other similar structures? The speed of power vessels shall at all times be regulated so as to avoid danger or injury to all manner of craft whether floating, moored, anchored or underway, or to piers, wharfs, bulkheads, draw spans or other water-front construction, either directly or by the effect of the wash or wave raised by such power vessel through its speed or otherwise. (a) No person shall operate a vessel in a manner where the speed and/or wake of the vessel may cause danger or injury to life or limb or damage to property. (c) "Slow speed/No wake" as used in this section means the speed at which a vessel moves through the water and is able to maintain minimum headway in relation to the vessel or structure being passed and producing the minimum wake possible. (d) State Police, on the recommendation of the Commission or on its own initiative, may designate a specific area not included in (b)1 through 6 above as a temporary slow speed/no wake area based on congestion, visibility, safety, or other good cause. All vessels moving through these areas shall reduce their speed to slow speed/no wake within a 200-foot radius of the sign or buoy, in addition to any restriction under (b) above. (e) No person shall place, anchor, or construct any buoy that states or implies that an area is a "Slow Speed/No Wake" area except as provided in (a) through (d) above. The State Police may remove or have removed any such unauthorized buoy. How can I report a vessel operator who I observe to be violating a New Jersey boating law or regulation? 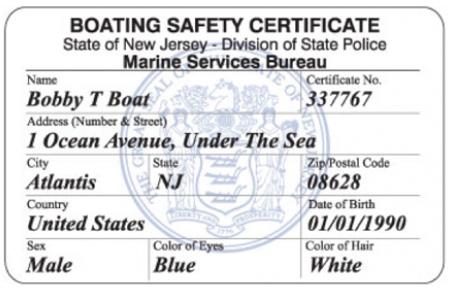 You can report boating violations to the nearest New Jersey State Police, Marine Services Bureau station (see the “Locate/Contact A Station” section of the web site for station locations and contact information). You will be asked to provide as much information about the vessel and its occupants as is possible, including, to the best of your ability, a description of the vessel, the location and direction of travel, the vessel registration number, a description of the operator and the number of passengers on board, and any other information that could be used to identify the vessel and/or the vessel operator. If a boating violation is not witnessed by a police officer, a complaint cannot be signed by an officer. In that case, you may file a complaint against the vessel operator. This will require that you contact the municipal court in the jurisdiction in which the violation occurred, and furnish the information necessary to identify the vessel and/or operator. Please remember that if you choose to file a complaint, you will likely be required to testify in court.